The Foundation runs multiple programs with an emphasis in Atlanta, GA. Programs include: SACKING OBESITY - Raising awareness for the current childhood obesity epidemic. Through this, we provide resources, tool and materials to participants on how to live a healthy lifestyle. Sacking Obesity camps occur once a year. This camp is a day packed with nutrition, health and wellness. 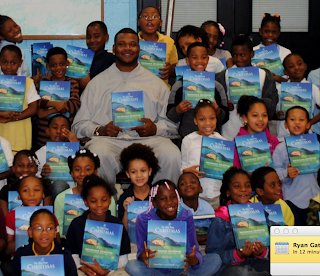 SACKING ILLITERACY- Donating books to local Boys & Girls Clubs while empowering youth that reading really is fun! PASS & PLAY HOLIDAY - Taking children from disadvantaged living situations shopping during the holiday season. FITDAY- Planning Field Days for after school groups to really try and emphasize the importance of being healthy. The Foundation’s programs have helped thousands of kids and families start a path to living a healthier, more active lifestyle. Why do you have a passion for this one in particular, is there a personal tie? I wanted to start a charity that could be an “agent of change” that we want the world to see. We partner with established, like-minded organizations to provide positive reinforcement that kids need to make good choices in life. The programs provide a unique blend of physical and educational activities for kids. Many of the programs require parents/guardians to participate as well which encourages the entire household to lead healthier, more active lifestyles. Is there a particular way you would want to encourage readers to be involved? Just being a positive role model to the youth that are around you, can make all the difference. Whether it’s a family member or a child in your community, taking the time to talk with them, help them with homework or tossing a football around, will make an impact. How would you define social responsibility? Kids need to realize that they have endless possibilities. Any way you can, help them have a life full of fun, information and motivation so they can go on to do whatever they want in life.